“The idea of staying at a house of someone living in a village has always thrilled me. Ever since I did that for the first time in Pangalengan, West Java, four years ago, I have always looked forward to get such opportunity. Lucky for me, good news came from Ramala, a friend of mine from college. She told me about a traditional old village named Kabuyutan Cipaku, located somewhere in the regency of Sumedang, West Java Province, and came up with an idea of home staying for a couple of days in that place. There is nothing really outstanding about the village except the fact that the people still preserve some of their traditional houses, and we still can find some ancient archeological sites and artifacts dating back to the time when the teaching of Islam hadn’t penetrated West Java. Sincere was the first word coming to my head when Teh Awang, a thirty six year old woman, gave us a warm welcome in the morning we arrived at her house. She was so friendly we soon felt like at home. We were going to stay at her house overnight. Like any other typical traditional house in South East Asia, the house was built on stilts, only lower. All the floors and walls were dominated with timber planks and bamboo, and that allowed the air to circulate very well inside the house. It didn’t take long for us to fall asleep as we lay back on the floor made of bamboo blade. Today, we still could see some traditional architecture rooted to the time when the only materials they recognized were woods, bamboos, and big chunk of volcanic stones. Originally, their traditional architecture doesn’t use glass and roof tiles. The houses I saw that day had been modified according to the current taste. Basically, these were typical Sundanese houses. The same style could be also found in some traditional villages spread all over West Java Province. The most authentic ones I had seen were in Inner Baduy, an isolated village located deep in the tropical forest of Banten Province. The only traditional architecture that remained original was the barns. I had no idea how many cows they had inside the barns, but I was pretty sure there were more than enough numbers of cows to meet the demand of beef in that village. It was ironic however that, according to Teh Awang, beef could hardly be found on their dining tables. They only ate it like once in a year. We had our first brunch just a few hours after we arrived at Teh Awang’s house. Nearly everything served on the floor (they didn’t have dining table) were picked up from their farm; the chicken, vegetables, and even the dessert which was made of fresh mango. As for the rice, they picked up from the field right at the back of the house. Self-sufficient might be the right word to describe this. While we had the brunch, Teh Awang asked us whether we wanted to have duck for the following day. I asked her where she could get the duck. She simply replied, from the back of her house. I later found that the stilt house was built in the middle of the farm. At the front yard, they grew mango tree, rambutan, and jackfruit. At the backyard, they grew vegetables, herbs, chilies, cassava, and they also kept their livestock there. With the fact that nearly everything could be picked up from the farm, Teh Awang hardly ever went to market for shopping. Most the time she took care of the house and her seven year old son who was in the second grade of primary school. As for her eldest son, she sent him to Islamic boarding school in Malangbong, Garut, a few hours ride out of Sumedang. Today, Teh Awang lives with her parents and her youngest son. Her husband worked in Karawang, and only returns couple of times every year. Many men in that village have to cope with choices whether they have to work as farmers or leave the village for another better job. After finishing the brunch, we were ready to go around the village. Teh Awang was about to guide us to see the archeological sites. To reach those places, we had to walk through the vast rice fields. It was rather challenging for me to walk on a narrow muddy path. I could slip anytime and fell to the mud. I was glad when I finally reach the first archeological site. We found a small monolith which was believed to be the tomb of Ratu Inten Dewi Nawang Wulan. I am not going to write or describe this woman because there has been much information about her that we can find in many blogs. I am not really sure who she is, but I think she was a noble woman that played a significant role in the history of Sumedang as a former small kingdom in West Java. 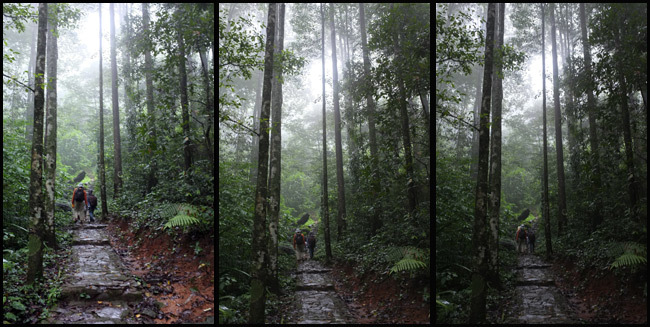 Leaving the tomb of Ratu Inten, we entered the forest which was obviously conserved by the village people due to its being sacred. Looking at the size of the trees, I could say that this forest was as old as the civilization in Sumedang or might be even older. The next monolith we came to was the tomb of Prabu Guru Aji Putih. It turned out that this man was the husband of Ratu Inten Dewi Nawang Wulan. What I read about him in many blogs was he founded the kingdom of Tembong Agung, which later became the kingdom of Sumedanglarang. So, practically, we were visiting the king’s tomb. Not far from the tomb, there was a sacred well. It was said that the water used to be clean and drinkable. Constructing the concrete wall around the well seemed to be a mistake as it caused the water to be murky. Another sacred tomb we found in the forest belonged to Sang Hyang Resi Agung. According to Teh Awang, this tomb was just discovered a few months before. I was rather surprised to hear that. By discovered, did she mean that all these years, no one was unaware of its existence? It was kind of interesting to find out how the people “discovered” the sacred tombs. Those tombs we had seen were probably not the real place where those people were buried. Those were more like monuments to honor or to keep them alive in people’s memory. As for how to discover them, it was through revelation. The biggest monolith we found was located on top of a hill at Dayeuh Luhur, almost a one hour drive from Kabuyutan Cipaku. It marked the tomb of Taji Malela, a man who changed the Kingdom of Tembong Agung into Sumedanglarang. To reach this monolith, we had to walk through a thick forest, climbing up hundreds of stone stairs. Along the way to the top, we passed by people coming with different intentions. Most of them came to say prayers in front of the monolith. They brought along fresh flowers and joss sticks as offerings. I even saw women coming with their beauty case and put it in front of the monolith. I was not sure what they were doing, but I could see they came with a shaman who led them to pray. I must say that despite the fact that I enjoyed the cool mountainous air in that place, I didn’t really like spending time in there amidst those people. Soon after we took enough pictures, we decided to return to Kabuyutan Cipaku. At night, the whole family of Teh Awang was gathered at home. I met Pak Embun Sobari, whom I later called Abah, a Sundanese for father. For someone at his age, he looked a bit too old. Perhaps, it was because he worked everyday in the rice field. We had a short conversation before dinner. Most the time, he told us about the resistance of the village people to the government’s plan to build a dam which will drown the entire village of Kabuyutan Cipaku. He said that the project was not feasible due to geological matters. Even the World Bank refused to fund it. It was not easy of course for the people of Kabuyutan Cipaku to let go their properties. The fertile centuries old rice fields and also the sacred monoliths became priceless treasures they wouldn’t let go. The plan was firstly initiated somewhere in the early 1960s by the government. Under Soeharto’s New Order Regime, a repressive method was used to push the village people to let go their properties. They were not allowed to build houses, roads, and any other infrastructures. They couldn’t renovate the houses, and electricity was forbidden. The conversation was over as dinner was served on the mat. That night, we had Sayur Lodeh, - a vegetable soup with coconut milk -, fried duck egg, and fried chicken. In the morning, I came to the kitchen at the back of the house. I wanted to see how Teh Awang prepared the breakfast. It was always interesting to check out someone’s kitchen in the village as they used traditional apparatus that I could hardly find in the city. However, nearly all households today used the 3 kilograms liquid gas as the conversion of kerosene. At Teh Awang’s kitchen, firewood was still used to cook rice. The dining room was located before the kitchen. The family had a dining table in it, but they never used it. They thought eating the meal on the mat was more intimate for the family. As for the breakfast in that morning, we had bean sprouts, chicken with soy sauce, and chili sauce which was irresistible. As for the dessert, we had Dodol, a sweet snack basically made from flour and sugar. The family made two kinds of dodol, the one made from mangos, and green beans. They occasionally took order from relatives to make this snack, usually for festive occasion such as wedding. After breakfast, I moved to the TV room at the centre of the house to have another light conversation with Abah who ironically smoked right next to his grandson. That morning, once again, Abah asserted his commitment to fight against the government’s plan to build the dam which would drown the village. I was astonished when he said that no single officer could make the plan into reality as there was the curse. Well, there was a myth among the village people that all those sacred monoliths we had seen on the other day would reveal curses for those who tried to remove their existence. I was not convinced with the story for sure, but it was still interesting to hear. I didn’t want to take any side in this issue. I knew that the dam was perhaps going to be built for a reason like providing electrical power for the island of Java and Bali, and also irrigating the surrounding rice fields. But with the fact that most area would be drowned by the dam were the hundreds of acre of fertile rice fields at Kabuyutan Cipaku, which rice fields would be irrigated? Before leaving for Bandung, I kindly asked the family to pose in front of their house. It was a lovely and warm traditional house. I really hope to see that traditional house again some other time, and not just in a picture.